20th Century Fox Unveil Four New Clips from Ridley Scott's 'PROMETHEUS' As First Reviews Surface Online! 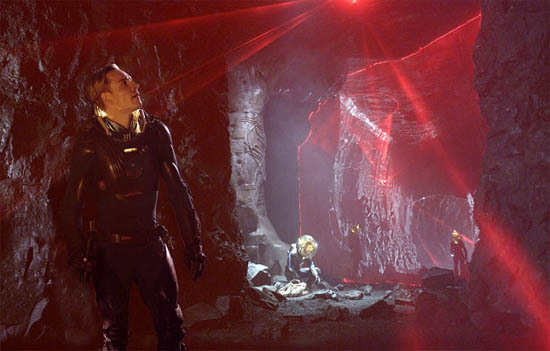 20th Century Fox have released four new clips titled "Before the Adventure", "Can't Let it Leave", "Don't Touch Anything" & "We Made You Because We Could" plus a new featurette "What is Prometheus?" for Ridley Scott's Prometheus as the first reviews of the movie surface online. The highly anticipated movie arrives in 2D, 3D & 3D IMAX theaters this June 8th & stars Noomi Rapace, Logan Marshall-Green, Michael Fassbender, Charlize Theron, Idris Elba, Sean Harris, Kate Dickie, Patrick Wilson, Rafe Spall & Guy Pearce. Hit the jump for the details. THR: "Ridley Scott's third venture into science-fiction, after Alien in 1979 and Blade Runner in 1982, won't become a genre benchmark like those classics despite its equivalent seriousness and ambition, but it does supply enough visual spectacle, tense action and sticky, slithery monster attacks to hit the spot with thrill-seeking audiences worldwide. Technically, Prometheus is magnificent. Shot in 3D but without the director taking the process into account in his conceptions or execution, the film absorbs and uses the process seamlessly. A visually stunning return to science-fiction by Ridley Scott caters too much to audience expectations when more imaginative boldness would have taken it further." ScreenDaily: "It has been three decades since Ridley Scott last dipped his directorial toe in science-fiction territory (with 1982’s Blade Runner), but with his fantasy epic Prometheus it is clear his striking sense of vision, drama and excitement fits perfectly with the genre and he has delivered a film that is already one of the most anticipated titles of the summer and should thrill, challenge and provoke audiences ready for his signature brand of intelligent and visceral film-making." Variety: "A mission to uncover the origins of human life yields familiar images of death and devastation in "Prometheus." Elaborately conceived from a visual standpoint, Ridley Scott's first sci-fier in the three decades since "Blade Runner" remains earthbound in narrative terms, forever hinting at the existence of a higher intelligence without evincing much of its own. Fox's midsummer tentpole has generated considerable excitement since it was announced the film would share some story DNA with Scott's 1979 horror landmark, "Alien," and a marketing push promising comparable levels of gore and tension should ensure that "Prometheus" catches B.O. fire." Prometheus arrives June 1st 2012 (UK) June 8th, 2012 (US). I'm reading: 20th Century Fox Unveil Four New Clips from Ridley Scott's 'PROMETHEUS' As First Reviews Surface Online!Tweet this!